So there I was, sitting in my seat, when a bevy of staff people came pouring into the arena floor. NOT among them was one Ryan Seacrest. He didn’t even bother coming to town to kick off Season 10 of the show that – let’s face it – made him a household name. Thanks a lot, Tiny Tim. Once everyone was inside and settled, they filmed lots of crowd shots with the crane camera. We were yelling various things, “I’M THE NEXT AMERICAN IDOL!” and “WELCOME TO NASHVILLE” and so on and so forth. Lots of screaming, banner-waving, and general excitement. They also had us do something kind of cool. They turned off the lights in the arena (cue the 15-year-olds making out) and had us get out our cameras, cell phones, anything that lit up, and turn them all on at once. I’m not sure how they’ll use this on the show, but it was pretty cool to watch. Here’s a link to a snippet I found online. The crowd filming went on for about an hour. Finally, they called a wrap on those shots and began the Dance of the Tables. Twelve tables, each followed by a curtain partition to separate it from the next table, were whisked out on the floor. It was explained to us that two “judges” would staff each table and four contestants at a time would sing for them ("judges" = various Idol staff, not Kara, Randy, Ellen and Simon TBD. By the time a contestant auditions for those four, he or she is on the third round of auditions). So once the "judges" had delivered their verdict to the group of four singers, they would exit and the next group of four would step up. If you were handed a Golden Ticket, you were to proceed to the right, and if you were not invited to continue on, your wristband was cut and you exited to the left. As I explained in the post from this morning, they started on the bottom and worked their way up. Which meant I had quite a while to decide what to sing – yes, at this point I still had NO IDEA. You can see that this is more than a couple of hours into the process, what with the empty sections at the top of the photo. 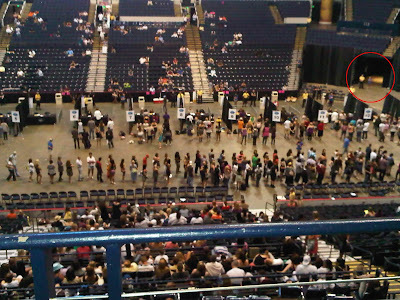 The tables and chairs and groups are all in place on the arena floor, and the long line near the bottom of the picture is row after row of four singers waiting to be told which table to go to. It looks like the judges at table 5 (far left) had gone to kill themselves take a quick break. Also notice the doorway circled on the right, where people that got Golden Tickets were taken to receive more instructions and fill out their paperwork. I would say one in every 100 people got a Golden Ticket. These first-level seat holders, again being the crazies, are the ones that were in the front of that wristband line and catching the eye of the producers. Which brings me to the double asterisk in this morning’s post. This USA Today article explains how Idol has some supposedly incredible cross-referencing and filing system. I call shenanigans. When I went and got my wristband, I am 99% sure the guy who checked my ID didn’t even write down my name. And he sure didn’t look at the number on the wristband that he gave me. Maybe after the first 10,000 people were wristbanded up, they stopped keeping great track of whom was auditioning. Or maybe I was just really uninteresting. Seeing as how everyone (except the judges) was wearing earpieces, I COULD get on board with them communicating about which row and section was about to be called to the floor (“Row D, section 121 is up next”), wanting to give someone in that particular section a Golden Ticket (“That’s the row (standout contestant) is in, right?”) and sending them to a certain judge (“You four head to Table 3”). BUT…. that seems like a lot of work. Though it does make sense, because a lot more people were getting Golden Tickets in the beginning of the day, than near the end, which jives with their theory of getting to know the people in line that stand outs and therefore, putting them through to Round 2. Also, I’ll tell you what else I think – I think some tables/judges are looking for true talent, and others are looking for the William Hungs. How else would they manage that? It’s much easier to maintain the ratio of talented performers and non-talented performers if you know that you are one of only a few tables that are putting William Hungs through to the next round, and the other tables are responsible for the good talent. I saw some “non-talent” getting tickets at the very table where I auditioned hours later (Number 11), so I choose to maintain that I went to a “non-talent seeking” table. So, conspiracy theories aside, the audition process was a long one. I saw the snail’s pace at which we were moving and felt hunger rapidly approaching. The people in my section that had gone to the food line and lived to tell about it reported that the lines were already incredibly long. I looked at my watch – it was 10:50 am. I knew as lunchtime approached, the lines would only get longer, so I took off to scavenge some food. Now. Let’s pretend that I am at a sold-out concert. That’s what it practically was anyway; almost every seat was full. And let’s also pretend that EVERYONE at the concert wanted something from the concession stand (because we had to throw our Cheerios away, remember?). So would you find it to be a GOOD idea or a BAD idea that only the first floor’s concession stands were open? And partially staffed at that? Y’all – I waited in line for AN HOUR AND A HALF for food. NINETY MINUTES. It took forevvvvvvvvvvver. And then I completely overpaid for it. I wasn’t sure when I’d see daylight again, let alone food – I had no choice! Begrudgingly, I took what I was counting on being the best chicken finger combo man ever made back to my seat. At this point in the story, I would like to mention some of what I saw while I was waiting in line. First of all, girls – just because you have long, unruly hair and throw on a skirt and some Keds, does not make you T-Sweezie. Nor does this make you unique, when there are TONS of girls running around this arena dressed just. like. you. Secondly, the Girl in her Underwear. Sigh. Just tune in to Fox next January, because I’m sure you’ll see her on TV. But she had on a bra, some pink ruffled underwear and then what looked like a pink tulle apron over her …front part. Thank goodness I saw her while I was waiting in the food line, because I would have dropped if not thrown up my lunch if I’d have seen her afterward. She was a cute girl – blonde hair, nice makeup, but SHE WAS IN HER UNDERWEAR! And boy were the heads a-turning. Everyone was noticing her. It was hard not to, bra and all. I read on Twitter later that night that she got her Golden Ticket, so her mission? Accomplished. I also saw some people curled up sleeping, heard lots of people loudly practicing, and came across some groups of people just singing their little hearts out – Glee songs, praise songs, herds of kids just singing and harmonizing and passing the time. It was like Woodstock meets a showchoir convention. So, so bizarre. I ate my lunch, listened to my iPod, read about Carrie's wedding in People magazine, texted with my sister and just surveyed the scene. I have ADD love to people watch, so I was truly entertained. Eventually the first level was clear and they started with section two. Finally, around 4 pm, I saw that I was in the homestretch. They were slooowly but surely approaching my section and I knew I had to decide what to sing and at the very least, go warm up my voice, considering I had not done much talking that day. I roamed the hallway until I found a semi-private quiet area to run through the song I was leaning toward. I called my sister so she could "approve" and belted out the chorus to “Stand By Your Man” as best I knew how. Is it the most exciting song in the whole wide world? Not by a long shot. But by this point, I DIDN’T CARE. I was SO ready to leave. I had been fighting my better instincts all day just to head on home, figuring I’d gotten what I came for (stories!) and was just postponing the inevitable (“thanks but no thanks”). But I had waited this long, so I figured there was no real harm in waiting a few more minutes. Song choice decided, I went back to my seat, secured my belongings and waited for the Man with the Megaphone to come collect those of us holding it down in section 211. I would have killed someone for a hotdog.